The events that unfolded in Fukushima in March 2011 still hold important lessons for all of us in the current era of nuclear power and global climate change. The documentary film Project Fukushima! 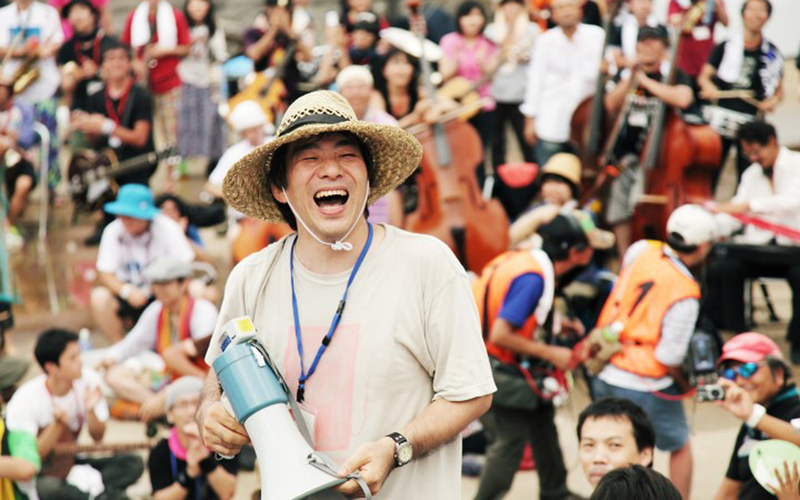 follows the preparations made for a festival held in Fukushima just five months after the earthquake and tsunami. Capturing the day of the festival and the efforts made in the lead-up to it, the film offers a quiet depiction of the way life in Fukushima has changed, the bearing our decisions have on future generations, and what it means to work toward building a future. The film’s message is concerned not with simply remembering what happened, but more pointedly on what we can do for our children, our children’s children and the many generations to come. This aspect of decision-making, taking into account future generations’ considerations, could not hold greater relevance than it does at the present moment as we begin to face the realities of global climate change and the pressing need for us to take action. The “new realities” of life in Fukushima are reflected in their preparations for the festival as the organizers are forced to take into consideration concerns about radiation and the ethical implications of bringing people to Fukushima to enjoy themselves there such a short time after the disaster. For the five-year anniversary screening, we will have in attendance one of the founders of the Project Fukushima! organization, Otomo Yoshihide, visiting from Japan. Project Fukushima! continues to organize festivals and related events on a yearly basis to this day. Otomo will talk about the efforts they have made and challenges they have faced in the time following the first year depicted in the film. Guitarist, turntable performer, composer, film composer, and music producer. Born in Yokohama in 1959, he spent his teen years in Fukushima. He has led multiple music bands, such as ONJT, Double Orchestra, Yuheisya and FEN, and is also a member of numerous other bands and music projects, including Filament, Kahimi Karie, I.S.O., Otoasobi no Kai and Emergency!. He has worked independently to create music widely and simultaneously all over the world. His output ranges from loud music using noise and feedback, to music focusing on the generation of sound itself, plus other work themed around jazz, pop music and songs. His film compositions number over 60 pieces, including Chinese cinema (Blue Kite, directed by Tian Zhuang-Zhuang), the work of leading Japanese film directors (Shinji Somai, Hiroshi Ando, Masao Adachi, Tomoro Taguchi), emerging directors in Japan (Satoko Yokohama), TV drama series (e.g. NHK (Japan Broadcasting Corporation) morning drama series Ama chan), and TV advertising. Recently his unit ENSEMBLES has been presenting musical pieces and unique concerts based on collaborations with a broad variety of people, and he has also been conducting musical workshops with disabled people, and projects which are open for amateurs. His published books include MUSICS (Iwanami Books), JAMJAM Diary by Yoshihide Otomo (Kawade Shobo Shinsha), and ENSEMBLES (Getsuyosha). Born in Tokyo, Japan in 1976. He obtained DEA (Athletic, Science and Technology of Arts) from Universite de Paris 8. He works with the visual media to intuitively deal with the social and political situation in Japan. Since the disaster of 3.11, he starts shooting at the stricken area on the theme of the relationship between 3.11 and the art, making a work as “3.11 Art Documentation”. In addition, he has been recording the past-3.11 Tohoku landscape, filming both the coastal areas, where everyday life has been taken away by the tsunami, and the forests of Fukushima, which have been contaminated by radioactive substances.